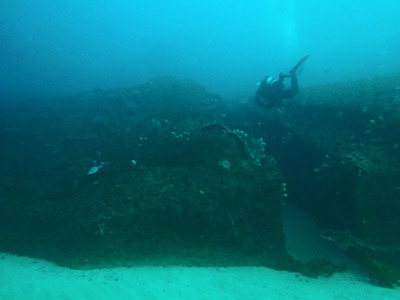 Michael McFadyen's Scuba Diving - The Split The southern side of Sydney is blessed with great dive sites, none of which are better than The Split. Actually part of the Barrens Hut reef (in my opinion Sydney's best reef boat dive), The Split is really a separate site due to the depth (average about 26 metres), the area of the site and the vast array of things to see at both sites. Located to the south of Port Hacking and less than a few hundred metres off Royal National Park, The Split is basically composed of a flat topped reef, covered in kelp, that drops vertically to the sand. However, just before the reef meets the sand, it is cut by a crack that runs north/south for a good distance. The crack, which of course gives its name to the site, is about four metres deep and two metres wide, although it does narrow in one spot. Running off the crack at right angles are a number of other narrow cracks that lead down to the sand. Some of these can be swum along. As well, there are a number of small swim-throughs and caves. To locate The Split, travel out of Port Hacking and head south between (if the seas permit) Jibbon Bombora and Jibbon Head to GPS Reading 34° 05' 31"S 151° 10' 23"E (this co-ord is AUS66 datum - see my GPS Page for details) and use the mark above left. This will put you at the southern end of The Split, within about five metres of the end. To anchor at the northern end, line up the house with the vertical crack to the right and use GPS 34° 05' 26"S 151° 10' 25"E.
Run in on either of these marks and anchor when reef comes up on your depth sounder. If you do not have a sounder, in a medium size boat the reef edge is when the house has just disappeared so drop anchor about two seconds later. In a smaller boat, continue running in for a good four seconds after it disappears before dropping anchor. Do not go too far as it will put you on the top of the reef where it can sometimes be difficult for your anchor to take hold. Therefore, it is important here to make sure your boat is staying in the one spot before you descend. This is The Split, north at left. A mosaic I made on 8 July 2014 when we had 30 metre visibility. It is at least 70 metres from the northern end to the southern end. When you reach the bottom secure your anchor before beginning the dive proper. Look around you and check your depth. 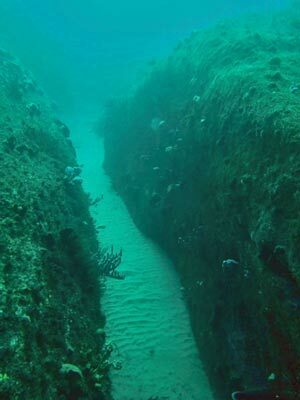 If you can see a wall or The Split itself and your depth is more than 22 metres, then you are probably on the reef edge. If you are on a kelp covered rock and your depth is shallower than 20 metres, you are on the reef top. If on the reef top, start swimming east until you strike either the sand or The Split. If there appears to be a canyon about five to ten metres wide, follow it to the north-east until you reach the main wall and turn right. This will take to the Northern End of The Split. 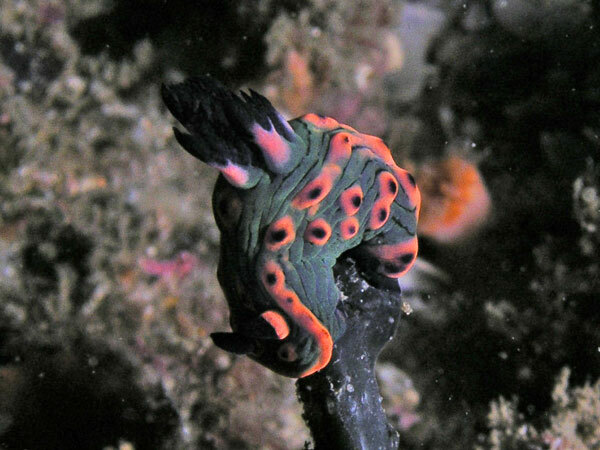 A very good example of the purple dragon nudibranch A new nudibranch that Kelly found in The Split. This description is based on anchoring at the southern end of The Split. If you reach The Split, turn to your left and follow it to the north. 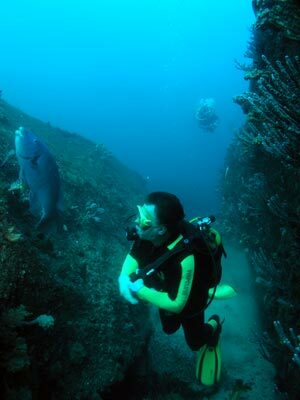 The depth here is 22 metres and there are often firefish, eastern blue devilfish and giant cuttlefish in this area. 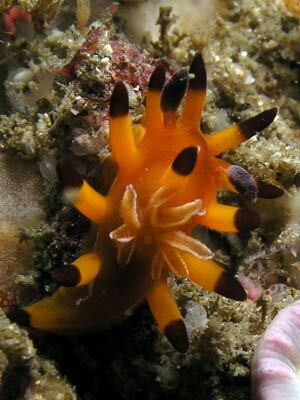 As you go along the small canyon, you will see fantastic gorgonias, sea squirts and sponges. There are two cracks running off to your right and you can explore down the second one, providing you are not too large. In the early 2000s in the area of this intersection, I saw a stargazer buried in the sand in The Split. At first glance it looks like a small numbray or a sole/flounder buried just under the the sand. However, clearing the sand away shows that it is one of the ugliest but most fascinating creatures you will ever see under the sea. Look carefully in The Split for one. 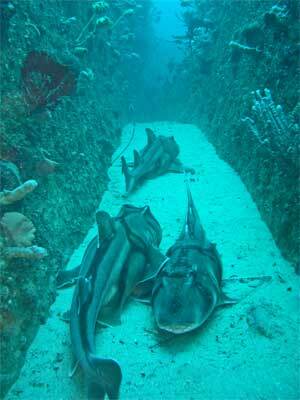 In Winter The Split is full of Port Jackson sharks. If you go down the crack to the right, return to The Split and continue north. At the end, The Split narrows somewhat and you take a dogleg to the right. Ahead there is an overhang, look under it for eastern blue devilfish. At this spot the depth is 25 metres and on your first dive here, do not proceed too far past this point. In July 2001 huge seas dug the sand out by almost a metre in this area. Come back to the northern end of The Split. Follow the reef edge instead (to the south). 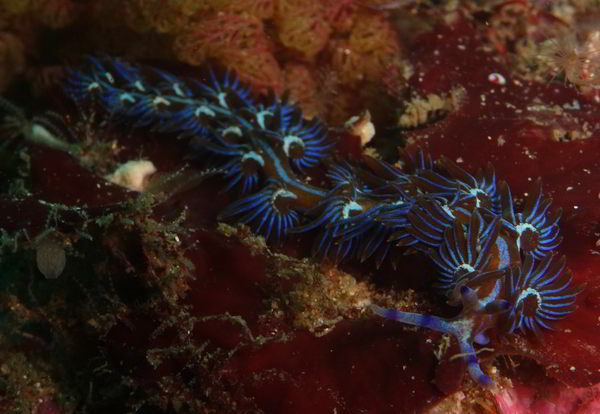 A few metres along Kelly found a pygmy pipehorse on the weed on the reef back in 2009. She had been finding them most dives since then. A few metres further along, there is a very small overhang of only a few inches. In May 2010, Kelly found a pair of upsidedown pipefish. These fish a very small, only 50 or 60 mm long and swim upsidedown. They were still there till mid-2013 and in mid-October 2010 one appeared to be pregnant. Keep going and you will go past the crack you explored earlier before coming to a sort of a dead end. Keep following the sand edge, this time back to the north (but the rocks are still on your right) until you come to a small break between the reef and a huge boulder. The depth here is 28 metres. Go through the break and out onto the open sand. Follow this main wall to the south for about 30 metres. You will come across a small overhang before veering to the left a bit. Just past here is the other end of The Split. There are normally some serpent eels in the sand here and sometimes firefish under the wall overhangs. You can either swim back over the overhang or go around the big boulder in front of you. If time permits, go around and behind there is another overhang and a sort of continuation of The Split. It closes up again but rise up a few metres over the surrounding rock and you will see The Split. In this area (which is near where you started) you will (always) find one or two eastern blue devilfish under the rocks on either side as well as giant cuttlefish. Go back down The Split until you see where you met it in the first place. Return to the anchor over the reef top. 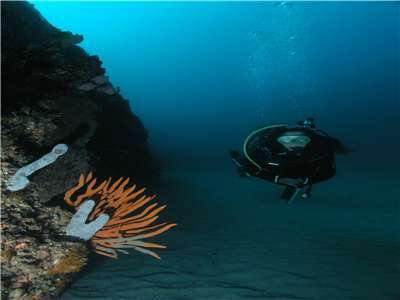 If you do not hit The Split when coming off the reef top but instead reach the wall (with sand and deeper than 27 metres), head to the south until you reach the area described above. On later dives here you can explore further, including the canyon that runs off the main wall back into the reef and the main wall to the north. At the mouth of the canyon there is a huge rock that makes a sort of mini split between it and the reef. In this area you will find a fascinating creature, about 50 mm high, that looks like a satellite dish. I do not know what it is called, but it makes an extremely interesting sight. Also along this canyon you regularly see many sea dragons and on one night dive, the smallest sea dragon I have ever seen. It was tiny, only 30mm in length. Fish to see here include kingfish, bream, blue gropers, flathead, eastern blue devil, wrasse of all sorts and sometimes sea dragons. Other more common fish are, of course, nearly always seen. 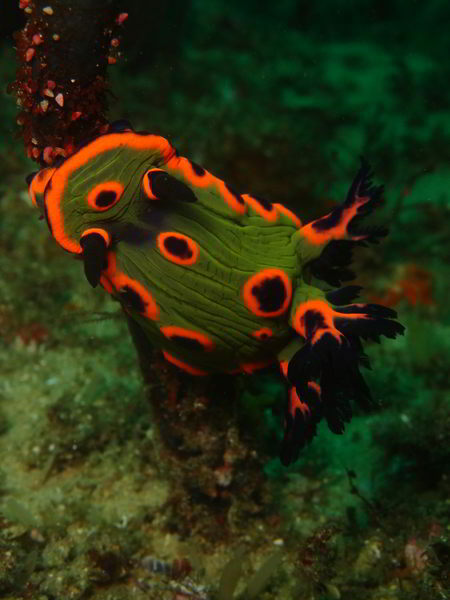 These are donut nembrotha nudibranchs - these are normally only found at Cabbage Tree Island at Port Stephens. Due to the depth, you can only spend about 22 to 28 minutes using air and a normal dive computer (say Aladin Pro), depending on how long you spend in the deeper bits. 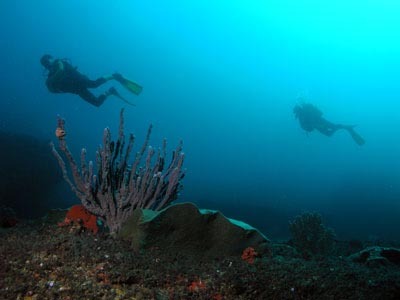 As this is a mostly square profile dive, make sure that you do a safety stop of at least five minutes at the end of your dive. The area is generally free of surge due to the depth but can sometimes have a current from the north. Visibility is usually good, often exceptional, and it is not uncommon to have 15 to 20 metres at times with even 35 metres not unknown. Video partly shot at The Split on 6 July 2011.